This area is most widely known for the Arenal Volcano and Lake Arenal. Arenal Volcano is located in at the center of the Arenal Volcano National Park was dormant for hundreds of years with only minor fumaroles acitivity until 1968 when it unexpectly erupted and destoryed the town of Tabacón. This is the most active volcano in Costa Rica and offers a spectacle of lights with its nightly explosive eruptions. 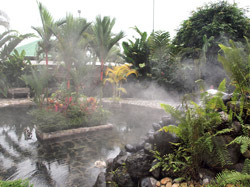 La Fortuna offers the closest airport to Arenal volcano and offers many tourist attractions such as day spas, whitewater rafting, bungee jumping, horseback riding, mountain biking, kayaking, sky trams and zip lines. La Catarata de la Fortuna is a 70 meter waterfall and has several resorts with hot springs such as Baldi Hot Springs Resort. Lake Arenal, an artificial lake, close to Arenal volcano, is situated in the northern highlands of Costa Rica in the Arenal Tilaran Conservation Area. It is approximately 30 km long and almost 5 km at its widest point with depths between 30 and 60 meters. A hydroelectric plant here provides electricity to 70% of the country and a hallmark of the Costa Rica's green energy policy. There are two species of fish that reside in Lake Arenal, machaca fish and bass. Some of the birds to be seen here are the hummingbird, woodpecker, kingfisher and toucan. Noteable mammals in the area are tapirs, jaguars and quetzals. Windsurfing is very popular November through April as Lake Arenal is known to be one of the world's foresmost windsurfing areas. Wakeboarding is growing in popularity here. Fishing and kayaking are among the most popular recreational activities on this lake.